17 OF THE BEST BIKE LOCKS AVAILABLE | muted. Whether you’re in an urban environment, in the suburbs, at college, finding the best bike locks for your budget is an absolute necessity. This article will provide 17 Of The Best Bike Locks Available. We cover two primary types of locks in this article; The U-Lock and the chain lock. The U-Lock is perfect in most circumstances. Its shape limits leveraging and the locking mechanism holds up well to hammers and chisels. 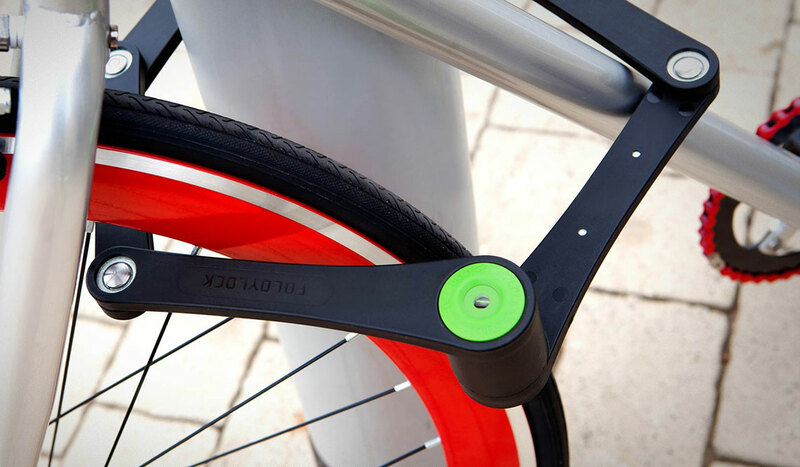 Mini versions of U-Locks allow you to lock a wheel and the frame. The larger versions can accommodate to tires and the frame. The chain lock is perfect for high crime areas. You’ll want to make sure you get one with thick links and a heavy duty padlock. The chain lock is perfect for high crime areas. You’ll want to make sure you get one with thick links and a heavy duty padlock. Chain locks resist leverage due to their link design and are also resistant to hacksaws and chisels. We also take a look at a couple high-tech keyless models. These include cuff locks and even a bike GPS tracking device. Just in case the thief gets past your lock. We don’t cover any cable locks as we feel they are too susceptible to cutters. 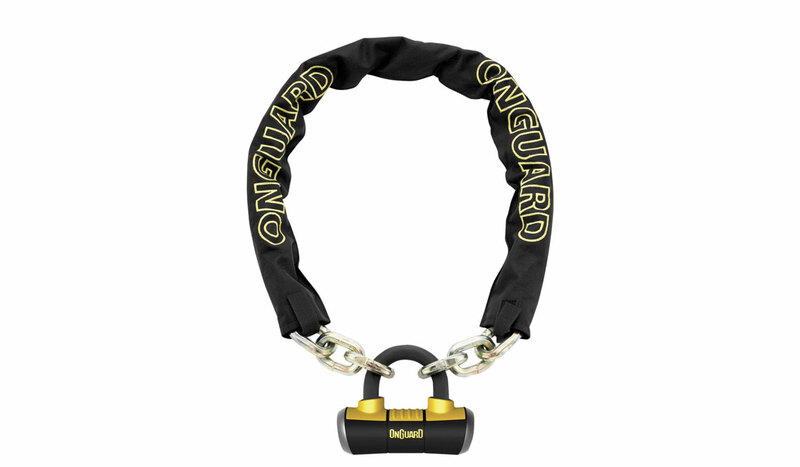 The On Guard Beast Chain With X4 Padlock ($93) offers a huge level of security. It features an X4 padlock. And a short shackle U lock mated with a 3.5′ chain. On Guard made the chain from reinforced titanium. The links are a massive 14mm. This is the ideal lock if you live or work in high crime areas. Also, You can use the Boxer U-lock separately as a disc lock. The dimensions of the chain are 110cm x 14mm. And the diameter of the shackle is a meaty 16.8mm of tough, hardened steel. 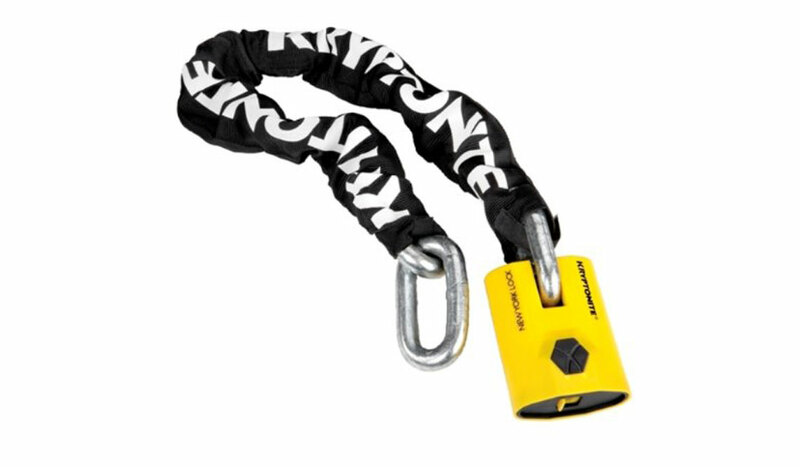 The Knog Strongman ($69) brings you a brand new take on a classic u-lock. It combines style with the great functionality you get from a double dead lock mechanism. The silicone covering is UV resistant and comes in a multitude of colors. The Knog Strongman collection is one of the best bike locks available. This ingenious Spybike ($164) puts a GPS tracker on your bike. It instantly alerts you when your cycle moves so you can track it. It looks just like the top cap of your handlebar post. Making Spybike tracker totally unnoticeable to thieves. And when the motion detector kicks in you get an instant SMS to let you know. The GPS tracks every bit of the bikes journey. All you have to do is contact authorities and have them get your bike. The Abus Bordo Granit X Plus 6500 ($154) boast heavy duty 5.5mm thick steel links and bars. Bringing you an awesome level of security. The protection shield applied to the links offers protection from saws and other such implements favored by cycle thieves. Every part of this lock utilizes specially hardened steel. While the Abus X-Plus Cylinder is one of the best around with its resistance to picking. With your purchase you get 2 keys. And with the included Abus code card you can order replacements. With a name like Mastiff you would expect an uber tough guard against bike thieves. Thats exactly what you get from this model. 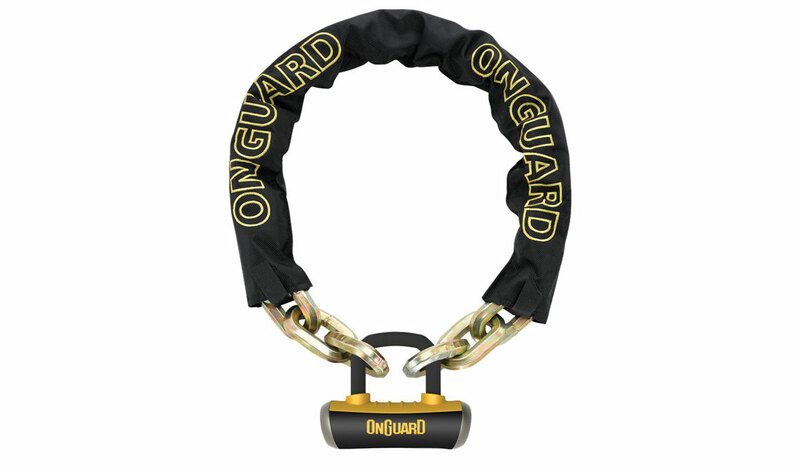 The Onguard Mastiff 8019L ($74) is a 6 inch long, 10mm thick reinforced chain, made from specially toughened steel. 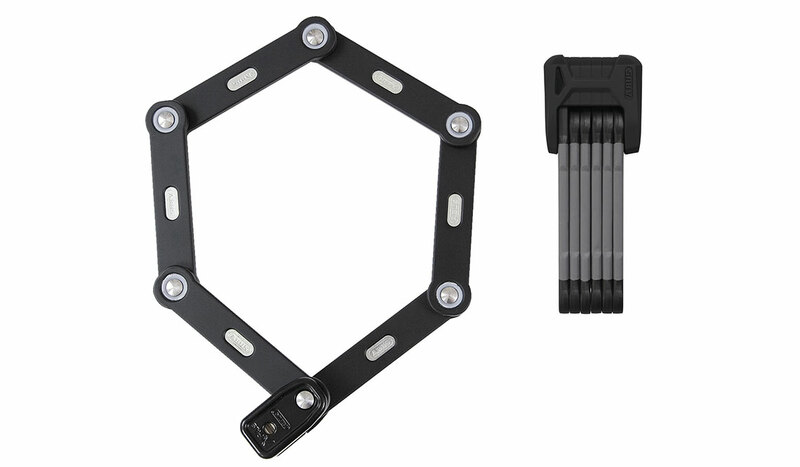 The hexagonal shaped links offer a number of locking options. You can also use the U-lock separately as a highly effective disc lock. This is one tough cookie that you will be happy to leave in charge of your machine. 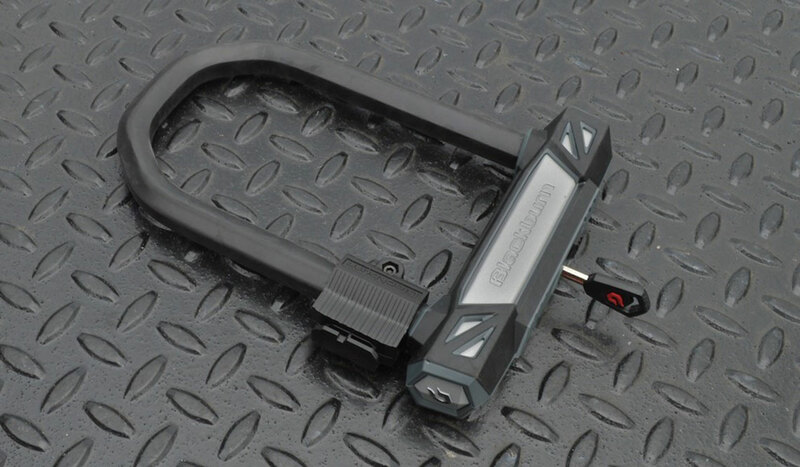 There isn’t another product on the market that looks quite like the Foldy Bike Lock ($95). An ingenious design that literally does what it says. The lock folds away when not it use and unfolds to create a great thief deterrent. In tests, the Foldy lock, was impervious to attacks from cutters, jacks, and crowbars. There are some great videos online showing how great this lock is. You may be sick of seeing the Kryptonite name on this list but there’s a reason it keeps showing up. They produce some of the finest bike locks around. The Kryptonite Evolution Mini 5 ($58) is another top notch product. It bears all the classic Kryptonite hallmarks. To start with the shackle featurs 13mm steel. Offering Maximum performance against all manner of attacks. While the center key positions offer resistance against leverage attacks. Its ease of use is great for the cyclist, yet a nightmare for the would be thief. Not only is the world getting smarter but so is its crooks, so you always have to be one step ahead of the game. One way to make pro thieves look like rookies is to protect your cycle with the Master Lock Street Cuffs ($45). As this lock has no fixed anchor point, the favored spot for leverage, and no space for standard jacks, there is no easy way for your opportunist thief to defeat these street cuffs. As an added bonus the lock folds in half for storage. 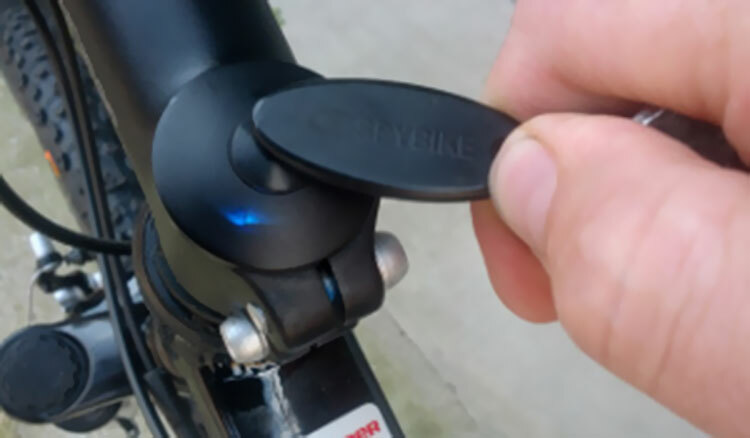 The pivot links allow for easy placemnt around both your bike and whichever object you choose to lock it to. The soft touch, pliable bumpers also protect your paint job, a fine lock indeed. 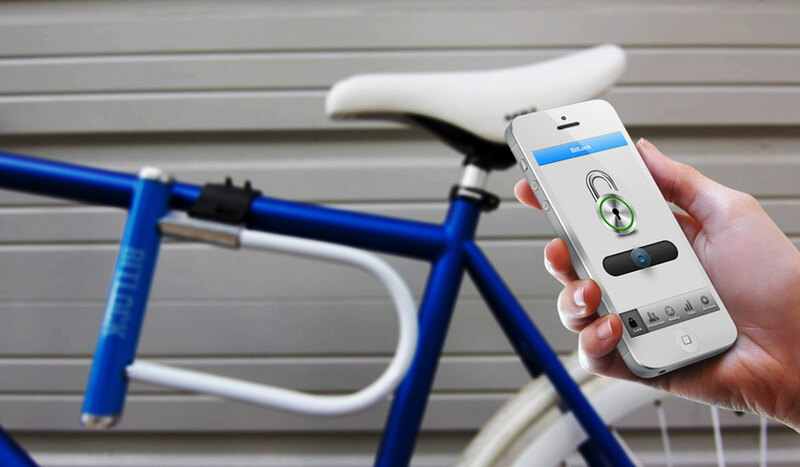 BITLOCK ($95) is a very cool keyless bike lock. No more fiddling around with keys. This operates on the same premise as a keyless car. As you approach your bike you use the phone app to control the lock. 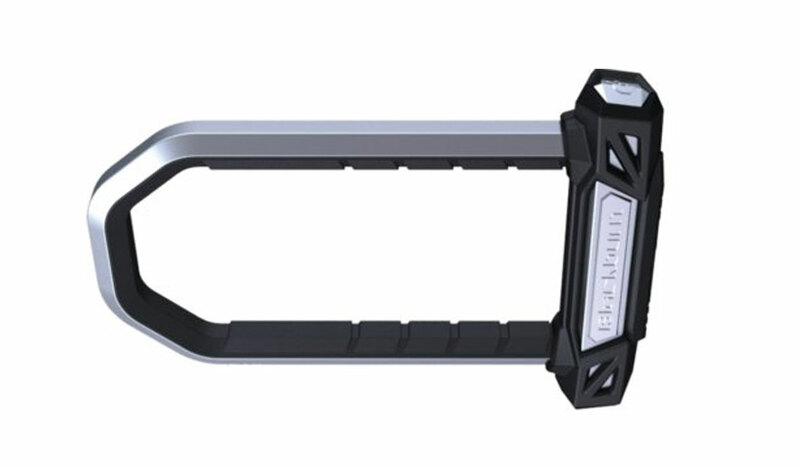 Not only is this a hi-tech lock, it also offers top-notch strength and durability. A great gift for the techie on your list. 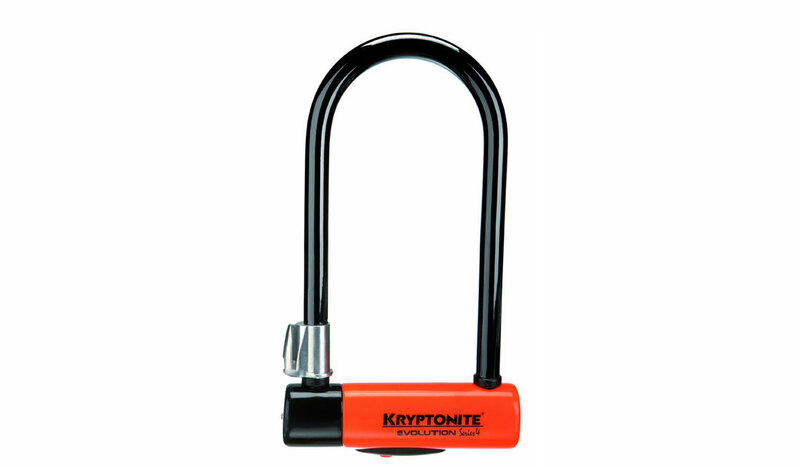 Any lock that carries the Kryptonite brand is something special. 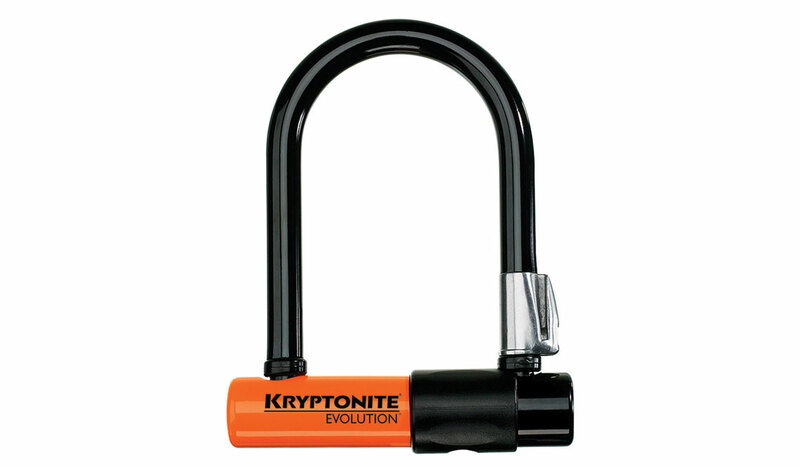 The Kryptonite Evolution Series 4 Standard ($69) certainly ticks all the boxes when it comes to cycle security. 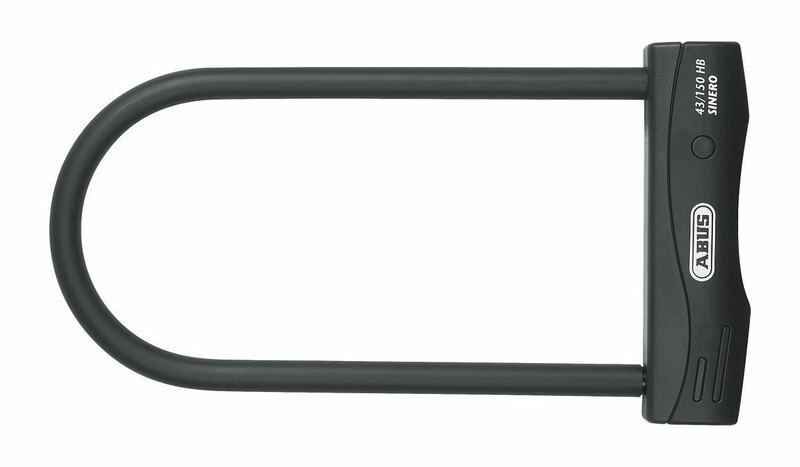 The 14mm specially toughened steel shackle offers Max performance. Kryptonite extensively tested the lock. They’ve shown it’s impervious to both leverage and cutting attacks. The design of the double deadbolt also offers security against twist attacks. It comes complete with 3 keys; one of which is illuminated by a high powered LED light with a replaceable battery. If you’re looking for a name to trust in bike security, you won’t go wrong with a Kryptonite product. If you are a big city cyclist then you need protection to suit your environment as any old bicycle lock will be easy picking for the pros. 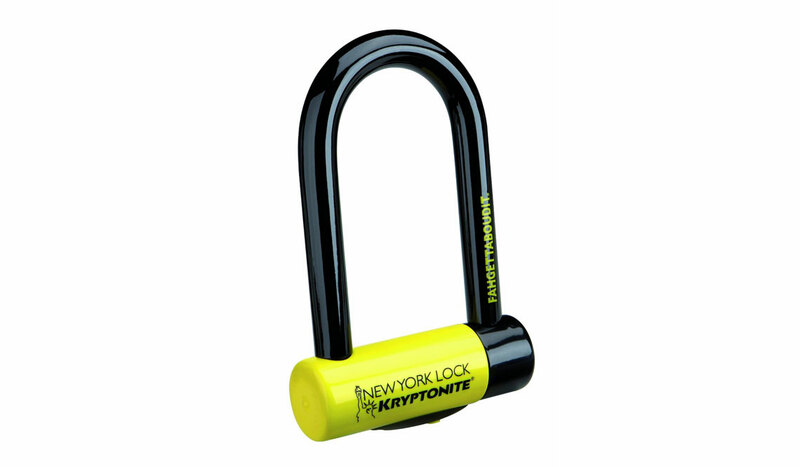 Step forward Kryptonite’s New York Fahgettaboutit U-lock ($99). This bad boy boasts an 18mm thick steel shackle designed to resist both leverage attacks and bolt cutters. This is the ideal lock for those living in areas with moderate crime. To put this into perspective, a lock which is ranked #1 is recommended for those who live in the burbs and have further bike protection in the shape of a Rottweiller. As New York’s crime rate is a whole different level the fahgettaboutit offers big city protection. 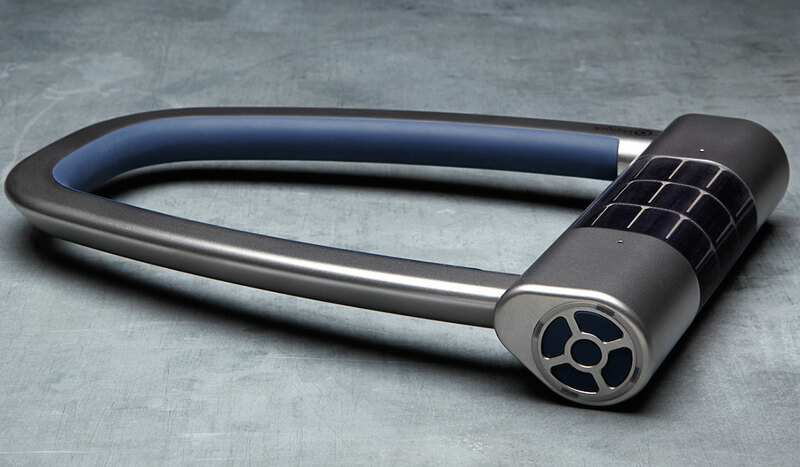 If you have a leaning towards the eco-friendly then the Skylock bike lock will be right up your street. The premise is simple. The lock uses solar power. Only 1 hour of sunlight renders the lock impenetrable to thieves. In the same way as the Bitlock, the Skylock ($159) uses an app as a remote. This eliminates the need for a key and allows you to let other use it by giving their apps permission via a code. A great idea that doesn’t get much better. There are many features to get excited about with the Abus Sinero 43 ($58) bike lock. First the double bolted hardened shackle. They made the shackle from 12mm steel. Make the lock corrosion and attach resistant. Testing ranked it right up there for strength and durability with the best. Additionally, you get two keys with this lock. The aptly named San Quentin U-Lock ($68) is the closest you will get to putting your bike in solitary confinement. The shackle construction features cust resistant 18mm alloy steel. While the anti scratch liner thwarts all theft attempts whilst leaving your beautiful machine without a scratch. The locking device itself is a dual bolt that is both pick and bump proof would leave even the cleverest jewel thief in Hollywood scratching his head. To cover all bases if the unthinkable does happen then this lock comes with a theft replacement guarantee worth $4000, it doesn’t get much better than that. The Stemlock won’t be available until later this year, but it is worth including on the list as an excellent alternative. 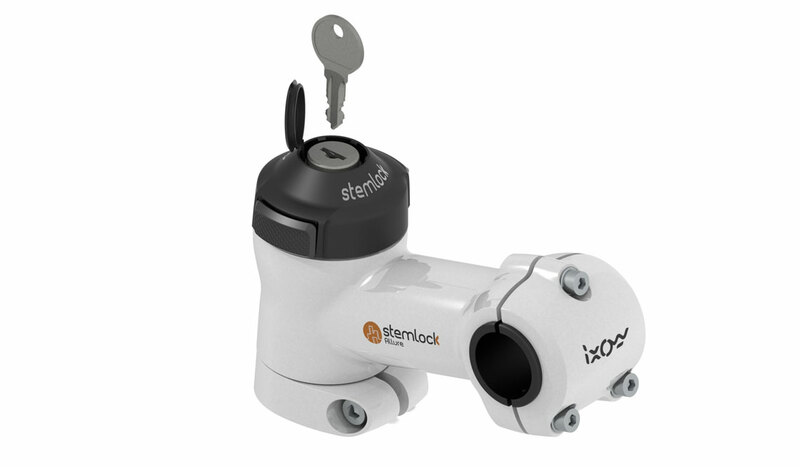 Unlike ordinary locks, the Stemlock ($103) permanently stays on your bike. Your handlebars are useless until you unlock it. This effectively means that any miscreant who helps themselves to your cycle will be unable to steer it, and at the least you can make some cash on the TV by shooting some entertaining videos. Joking aside this is a very cool device. Combine this with another of the locks on this list and you effectively have a Fort Knox type security system on your cycle. The longer shackle on the Blackburn Leavenworth U-lock ($45) gives you a much wider choice when it comes of stationary items to attach it to. The 8 ton pull strength, 14mm alloy steel shackle, dual bolt locking mechanism, central locking system and laser cut key all add up a serious bit of kit as far as bike security is concerned. 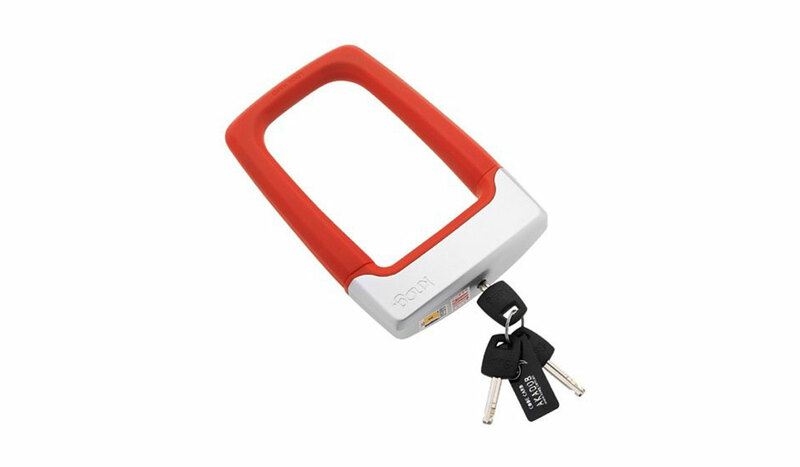 No longer are you bound by the size of your lock when determining what you can attach it to, and a line of bikes each attached to the other with this device will be as safe as houses. The last product from Kryptonite to make our list is also the one that offers the highest level of security from this outstanding manufacturer. The armor-plated disc lock on the Kryptonite New York Legend 1590 ($124) is designed for use in the toughest crime areas. The hardened steel sleeve is reinforced and shrouds the body of the lock to offer a level of protection rarely seen in a domestic bike lock. The disc style cylinder offers over 1m key variations, making it one of the best around. Add into this mix the double deadbolt locking system and you have a lock that will hardened crims tearing their hair out, before moseying on along to a less protected cycle.